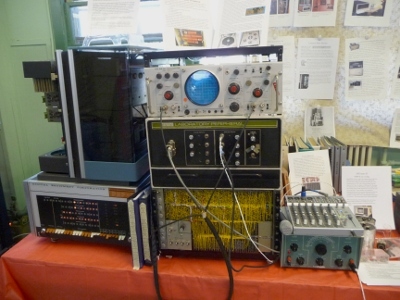 The retro computer hobbyist group MARCH hosted the Vintage Computer Festival East 2012 exhibit. I brought a Straight 8 Computer with 4k core, along with AX08 laboratory peripheral (from my 8/I), DF32 Fixed head disk drive, ASR-33 Teletype, Tektronix RM503 oscilloscope for X-Y monitor, DECmate III, and Letterprinter 100/LA100 printer for my exhibit. The PDP-8 I brought was the first model of PDP-8 computer. The DECmate III was the next to last of the PDP-8 line of computers. The straight 8 is made without any IC's, only discrete transistors and the DECmate III made 20 years later uses the 6120 PDP-8 processor on a chip. The straight 8 link above has more information on the computer and documents what I did to restore it to operation. I was showing how the AX08 could capture a signal from a signal generator or a microphone and display it on the Tektronix monitor. I also had a program to punch block letters of what you typed on paper tape. I ran out of time trying to get other programs to run. The DECmate III was running OS/8 and I had it printing out an ASCII art cat. I had to straighten out the teletype keyboard. I had modified it from even or odd parity it was originally to mark parity which disk monitor system needs but the modification wasn't working properly. All the computers behaved fine this time.